By CNN'S HOLLIE SILVERMAN, EMANUELLA GRINBERG, NICK VALENCIA, JUDSON JONES, DAKIN ANDONE, TRISTAN SMITH, CHERI MOSSBURG, AMANDA WATTS, JOE SUTTON, GIANLUCA MEZZOFIORE, STELLA CHAN, AMANDA JACKSON, CHRISTINA ZDANOWICZ AND JENNIFER SELVA CONTRIBUTED TO THIS REPORT. 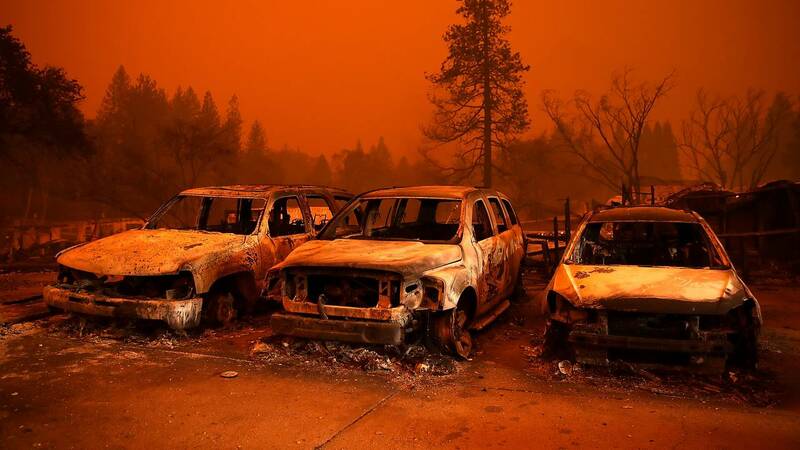 (CNN) - One of three major wildfires roaring though California has burned its way into state history as the most destructive blaze on record in terms of structure loss, with more than 6,700 structures gone in two days, according to Cal Fire, the state's fire-fighting agency. Authorities have received reports of two fatalities in the city of Malibu, and the Los Angeles County Medical Examiner-Coroner's office said it was working to confirm whether they are related to the wildfires. At least 52,000 residents were forced to evacuate from Butte County as the fire burned 90,000 acres. In Southern California, strong Santa Ana winds were fanning two fires, including the Woolsey Fire, which by Friday morning had burned across US 101 and was heading toward Malibu. The Woolsey Fire exploded from 2,000 acres to 8,000 in Los Angeles and Ventura counties in a matter of hours. Friday evening, officials said it had grown to 35,000 acres. And in part of Malibu itself -- a city of about 12,000 people known for beachside homes owned by celebrities and millionaires -- a mandatory evacuation was issued Friday. The Hill Fire is the other fire burning near the site of this week's mass shooting in Thousand Oaks. The fire started Thursday afternoon and spread quickly to cover about 6,000 acres, fire officials said. Friday, part of it was burning into the footprint of a 2013 wildfire, which could slow its spread, Ventura County Fire Chief Mark Lorenzen said. The Hill Fire was 15% contained by Friday evening, at 4,531 acres. A round of Santa Ana winds is forecast to whip the area Sunday through Tuesday, though it may be weaker than Friday's.